While the worldwide semiconductor revenue grew by a modest 7.9% to reach a total sales revenue of $339.8 billion in 2014, the worldwide semiconductor foundry market grew by 16.1 percent in 2014 to achieve $46.9 billion in revenue, according to market researcher Gartner. The biggest jump in the semiconductor foundry market growth was earlier seen in 2010 which was estimated to have grown by >20%. After 2010, semiconductor foundry industry continuously growing at a rate of more than 10% every year. 28 nm node is most growth-enabling node for top three semiconductor foundries; TSMC, UMC and also Globalfoundries to increase their revenue and ranking. TSMC could do even better than others due to success of its 20 nm production. TSMC has a share of 53.7% in the total foundry market, and has increased its revenue by 5 billion in 2014, according to Gartner. In first quarter of 2015, TSMC has reported a revenue of NT dollar 222.0 3 billion, a decrease of 0.2% compared to fourth quarter of 2014. TSMC is reported to have generated its 30% of revenue from 28 nm process node, and 16% of its revenue is from 20 nm process. However for the second quarter of 2015, TSMC expects a sales revenue in the range of NT$ 204 billion-$207 billion, quite a drop from the first quarter of 2015. Going further TSMC expects its revenue to recover to growth path in the third quarter of 2015. TSMC plans to start the mass production of 16 nm chips in the mid 2015, and 10 nm chips by the end of 2016. The factors which helped robust growth of foundry business includes inventory stocking in the second quarter by customers, increase of units sold in ultramobiles, the strength of the Apple's supply chain riding the success of the iPhone 6 and 6 Plus in the second half of the year, a conversion of integrated device manufacturer (IDM) revenue to foundry revenue and wafer demand from the early adoption of wearables, according to Samuel Wang, analyst from Gartner. UMC had lost its share during 2011 to 2013 due to its delay to start early production of 28 nm chips with acceptable yields. Where as in 2014, UMC could increase its share by achieving full production of 28 nm chips, and estimated to have generated a revenue of $4.62 billion to take the second position in the semiconductor foundry ranking, as per Gartner. The No. 3 position went to Globalfoundries with $4.4 billion revenue, representing 9.4 percent of the market, according to Gartner. 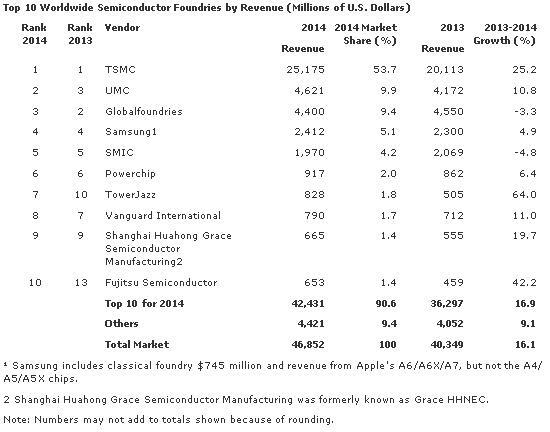 Find in the table below the remaining other 7 top semiconductor foundries in the world. Due to the growing demand of semiconductor ICs such as touchscreen controllers, display driver chips and power management integrated circuits (ICs) which are manufactured using older nodes and 200mm wafers, chip foundries are expanding 200mm capacities, finds Gartner.